The Minister of Transport, François Bonnardel, has given a mandate to Quebec's automobile insurance board, the SAAQ, to create a distinctive visual to highlight veterans' contribution, Radio-Canada has learned. 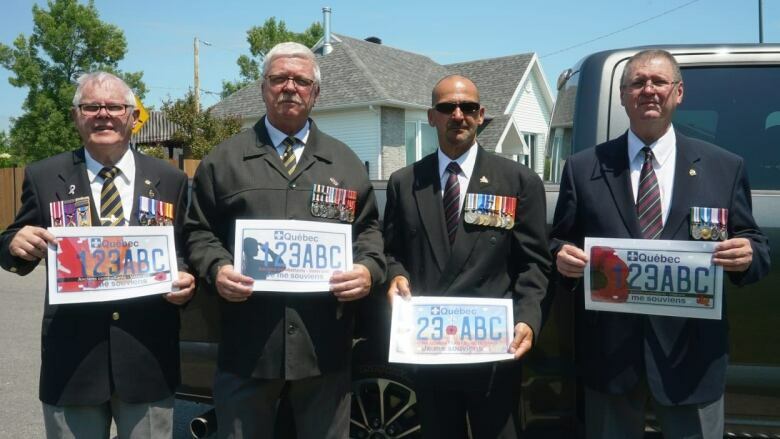 Quebec's 60,000 veterans will now be honoured on the roads with specially designed license plates — something a veterans' committee has been demanding for a decade. While working in collaboration with veterans, the SAAQ will take inspiration from what is being done elsewhere in the country and present a draft plate to the minister by March 31, 2019. It will be a design that goes beyond the small poppy that has adorned veterans' license plates since 2005. This comes as welcome news for veterans like Pierre Dugal, who have long been pushing for what he calls an "upgrade." "It's a great recognition for those who have sacrificed their lives," he said. Dugal is spokesperson for the committee that has been advocating for new veteran plates. After finally getting the proposal approved, he joked "I think I'm going to have a heart attack!" He said his group won't be able to insist on a visual, but the government will be asking for recommendations. Already, the group has prepared a range of suggestions, asking for words like "veterans" or "former combatants" to be included. The Coalition Avenir Québec (CAQ) is following through on a campaign promise made in September to fast-track the creation of these new plates. Dugal said he was surprised by the speed at which the CAQ has started the ball rolling. "We have no words to describe the speed of execution."